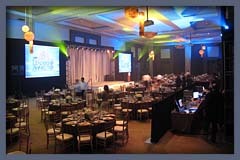 Event Staging - Abracadabra Presentation Graphics, Inc.
See photo examples of Abracadabra Staging Events. 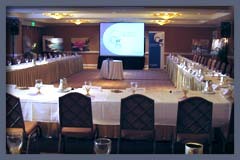 An effective presentation allows you to be more persuasive as you deliver your message. 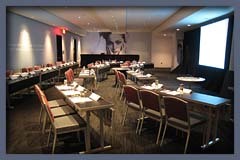 Whether you are bringing in a few doctors for a focus group, running a sales training event with a couple dozen sales reps, or planning your trimester sales meetings, or your national or even global sales and marketing events, Abracadabra has the experience, personnel, creativity and execution to make your event a winner. 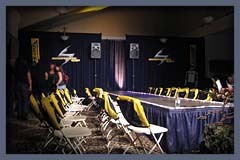 As one of Orange County's oldest and most trusted Multi-Media Production Facilities, Abracadabra is the perfect choice for your next presentation, meeting or staging event. 4. Execute with creativity, high energy and excitement. Abracadabra strives for an uncompromising level of service with crews of professional, accomodating and experienced staging technicians dedicated to making your event a success. 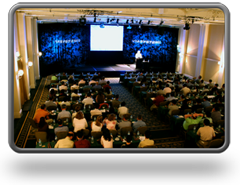 Our goal is to provide a perfect event, smooth and controlled operation, seamless transitions, managed with an invisible hand. We believe in doing the detail work up front and getting a firm handle on the possibilities both positive and negative, so that when it comes time to bring in your team from all over the country, or all over the world, there are no surprises. Meetings come in all shapes and sizes, and each meeting requires specific solutions to achieve success in a given circumstance. What that means in practical terms is that there are no "cookie cutter" solutions. 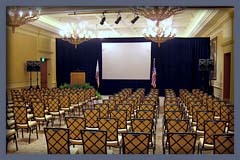 Each event is unique and requires the utmost attention and consideration, and a practical solution geared toward the ultimate success of that particular event's requirements. That being said, there are certain typical elements that are usually present in most large scale events.